Dr. Roger F. Steinert sees benefits for patients in the collaboration between the Gavin Herbert Eye Institute and Orange County's vision care industry. What makes UC Irvine School of Medicine's Gavin Herbert Eye Institute a new model for academic eye centers? It is a commitment to collaboration with the region's vibrant vision care and medical device industry. Orange County is home to the highest concentration of vision technology companies in the world. 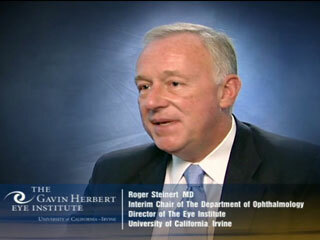 Working with them has been a cornerstone of the institute since the Department of Ophthalmology was founded in 1975. Within the department, we have assembled a peerless team of scientists, engineers and physicians. This internationally recognized group includes geneticists, infectious disease specialists and developers of sight-preserving technologies for macular degeneration, diabetic retinopathy, glaucoma, corneal disease and cataracts. Their work has put the university in the top echelon of institutions receiving National Institutes of Health grants for vision research. Our physicians and researchers are pioneers in developing the most advanced vision treatment and techniques used today. They continue to play a vital role in the development of technologies that make a difference in people's lives. From basic science discoveries that create the foundation of the next generation of product developments to the clinical studies that optimize new therapies, the institute's faculty is committed to being an active collaborator with medical device and pharmaceutical companies, inventors and entrepreneurs. Being at the forefront in eye research makes the Gavin Herbert Eye Institute a magnet for the best and the brightest residents and fellows, the next generation of physicians, surgeons and scientists. It equips us for one ultimate purpose: to keep UC Irvine and Orange County in the vanguard, providing unparalleled patient care. We invite you to embrace the vision: the creation of a world-class eye research, teaching and patient care center here in Orange County. Together, we can Shine the Light.